Several weeks ago my kids and I were driving when I spotted a table in the alley behind our church. Like the dedicated furniture hoarder that I am, I immediately threw the car into reverse and backed into the alley to check it out. 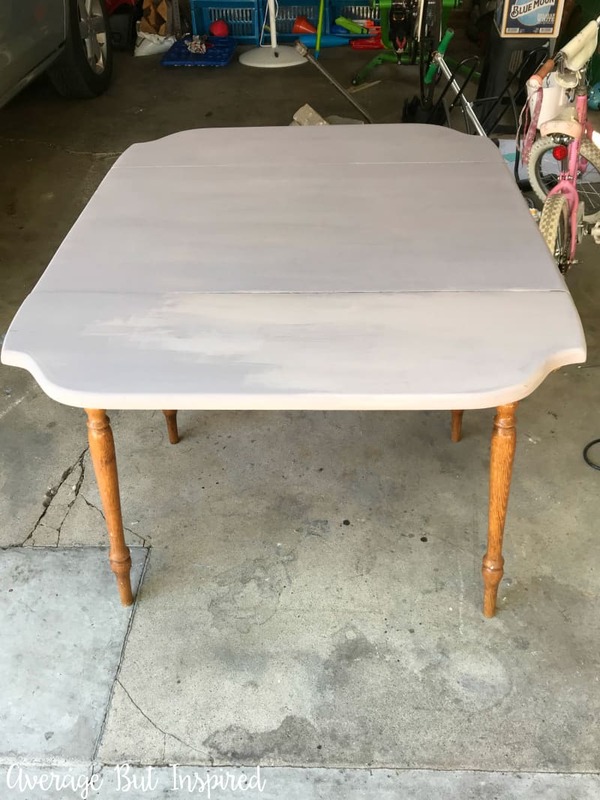 It was an old drop leaf table that hadn’t sold at the church’s annual rummage sale, and it had been put out (along with a lot of other random stuff), just waiting for me to come along and scoop it up! Divine furniture intervention? I think so. I struggled to get it into the hatch and sort of got it to fit. Being unable to close the hatch door, I enlisted the help of my children, and pleaded with them to hold onto the table so it wouldn’t fall out as I drove us the four blocks home. They told me I am crazy and I told them I’m giving them memories to laugh about someday when they’re grown. 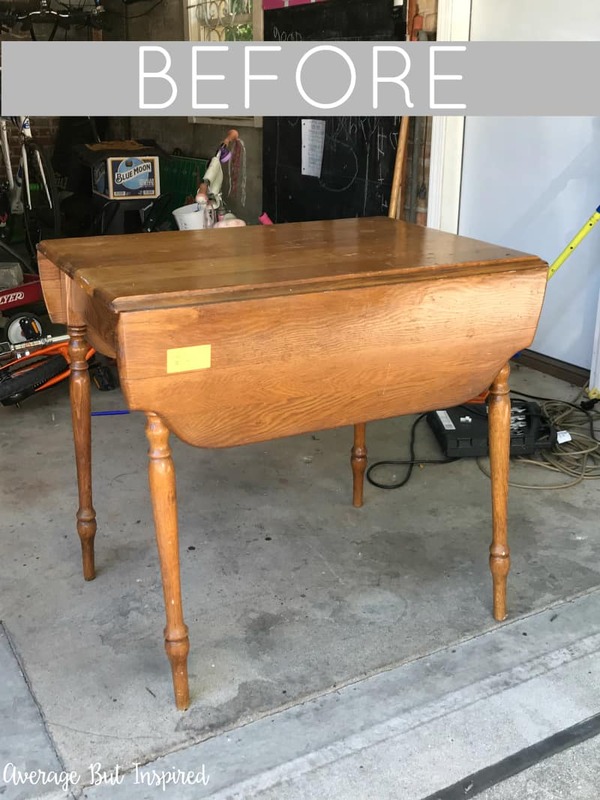 Having already dealt with my children’s judgment, I next had to face the laughter of my husband and his friend, who had no faith in my ability to tighten the table’s legs and make it pretty again. I got to work and showed them. Because the table had been out in the rain, I sanded it down and sprayed it with two coats of Zinsser Shellac. 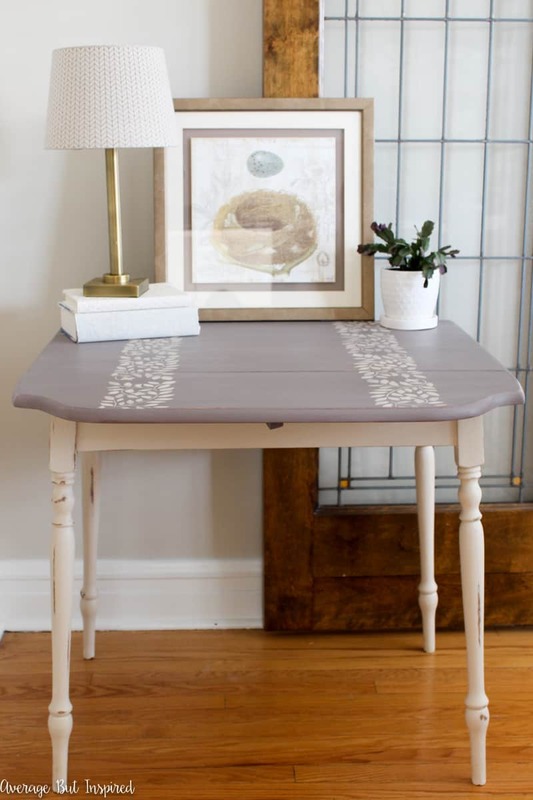 Then I painted the table top with two coats of ArtMinds chalk paint (available at Michaels), in this color. 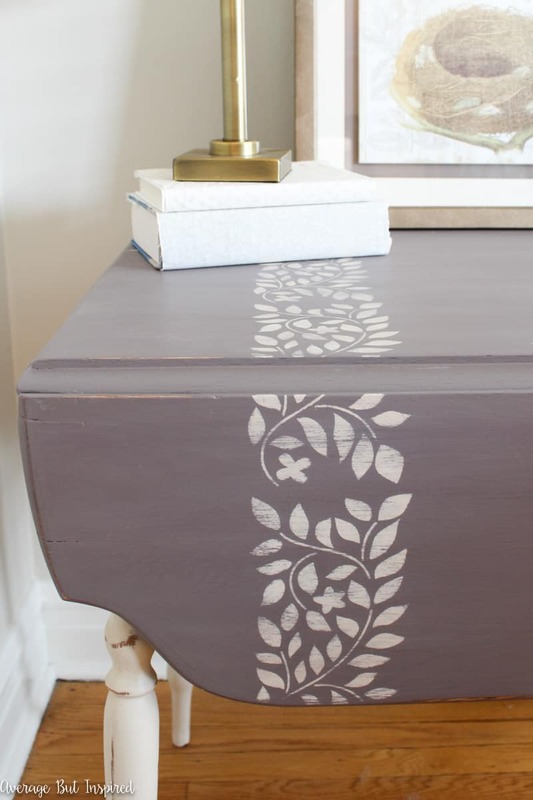 I’ve used this paint a couple of times now (like on my Mirror Makeover) and I like it and its low price! 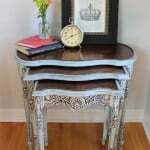 Once the top was finished, I painted the table base and legs with FAT Paint in Parchment. 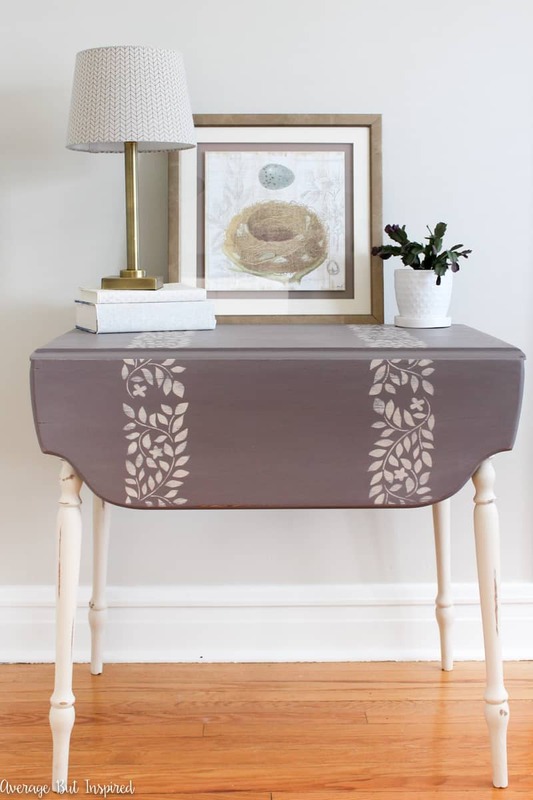 I had this color left over from the Console Table Makeover I did last year and was happy to put it to good use because it’s great paint with great coverage! 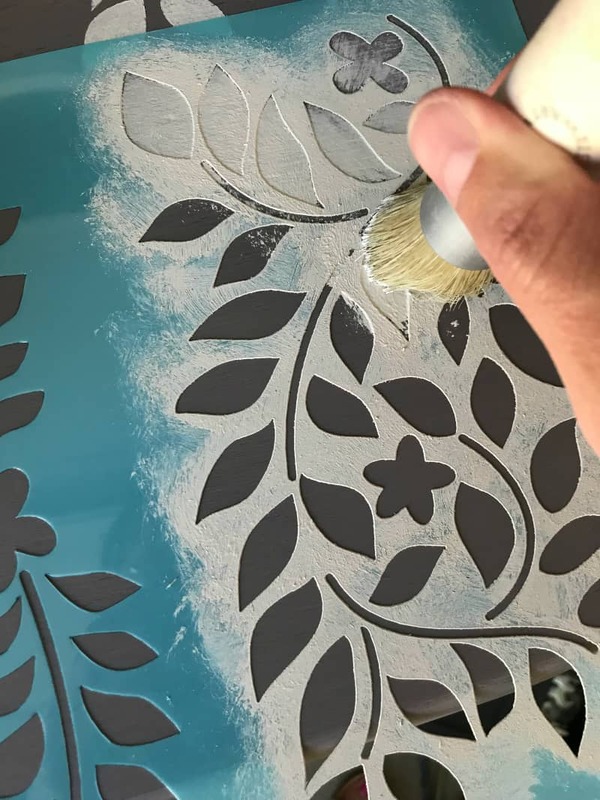 I decided to add a stencil detail to the table top because, for better or worse, I have a hard time leaving things “plain.” I used this stencil and carefully dabbed on the same color paint used on the table legs (Parchment by FAT Paint Co.). Once the paint was totally dry, I used a fine grit sandpaper to lightly distress the legs and edges of the table top. Then I used the same fine grit sandpaper on my sander to lightly distress the table top and to remove some of the paint left by the stencil. I was going for a somewhat aged look, but not overly beat up. Then I sealed it with a coat of clear wax and buffed to a subtle sheen. 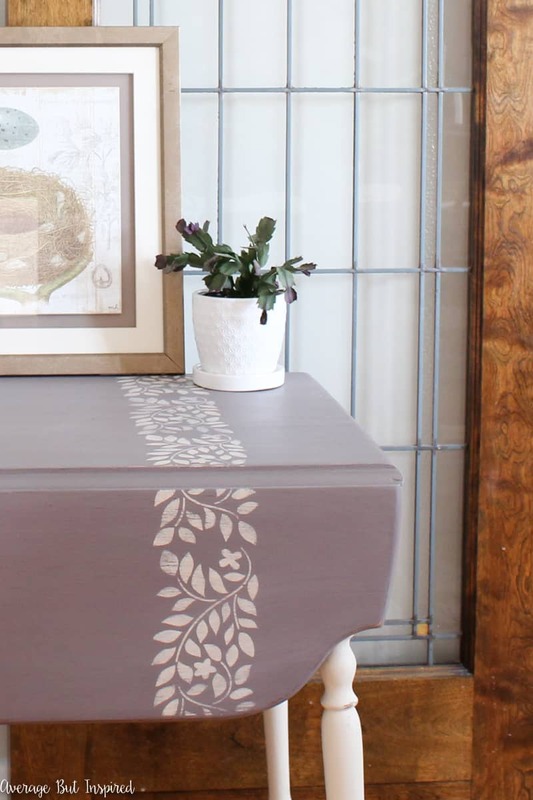 How do you think my painted drop leaf table turned out? Not too bad for an alley find, right? 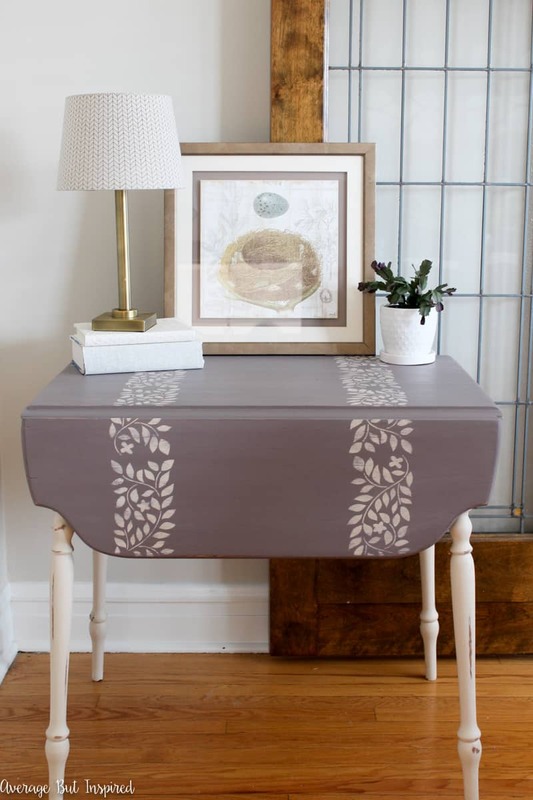 I think the stencil was a good touch; not too much detail and just enough to make this table have a little more personality. Plus, how fun is it that you can adjust the levers underneath the table and make it larger when you need it? 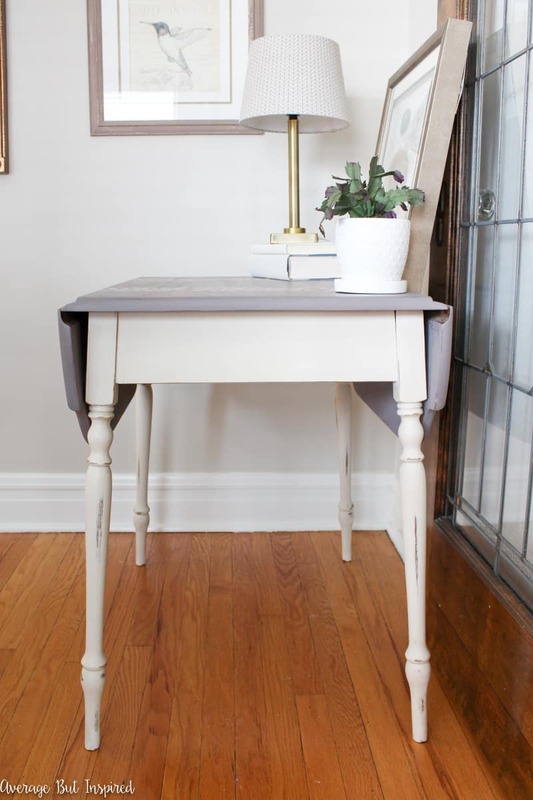 I think this little alley cat is giving my other alley table makeover a run for it’s money! If you agree, I’d love for you to pin this post to Pinterest to share the inspiration (thank you)! What’s the best thing you have found in an alley or on the side of the road? Let me know in the comments! 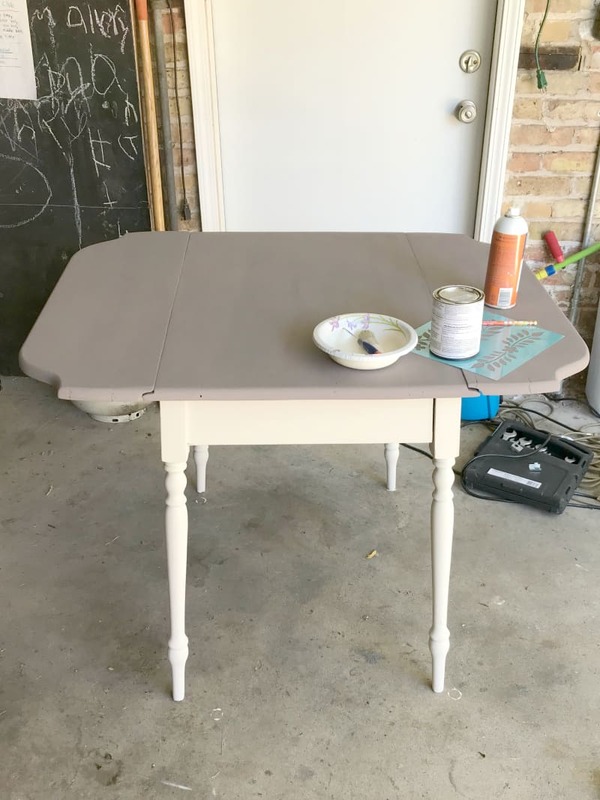 Wow, what a great makeover on your alley table find! Great job! You find the best items. That table is just too cute. When I get to Austin my new husband is in for a treat. Ha ha. When we visited last weekend I saw this table in the basement. I have to agree it was nicely repaired and very pretty with its makeover. I have to disclose I’m her mother-in-law but I also believe she is creative AND very talented with her “Average But Inspired” designs. Beautiful! 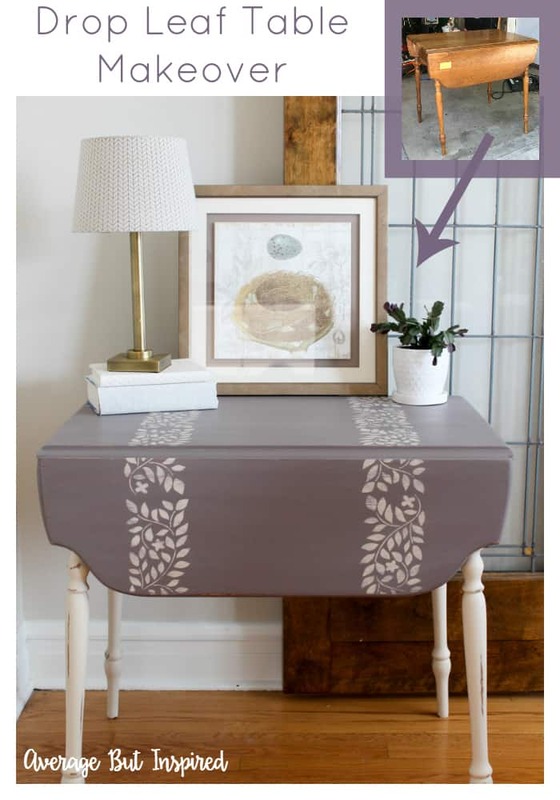 I just bought a drop leaf table but I think the top is laminate…. 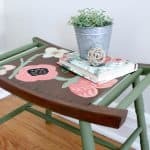 I’m trying to do my research and make this old table beautiful! What brand of wax do you use? 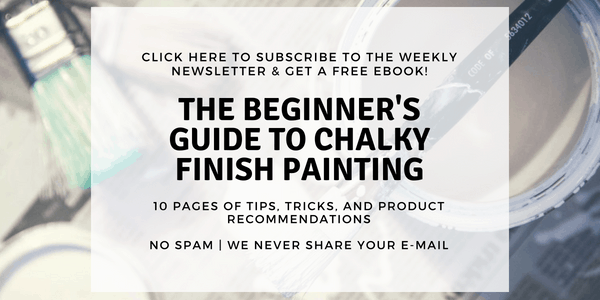 Any other tips you may have for this beginner? 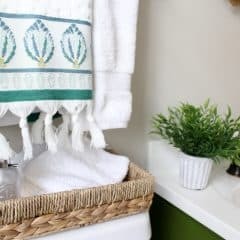 A Dated Powder Room Gets a Bold Makeover!